Linde Philippines, Inc. and EMME-Subic Transport Corporation recently signed a contract with the latter being assigned to handle the hauling requirements of Linde. EMME-Subic Transport Corporation is a logistics company that has been providing hauling services in the country while Linde Philippines, Inc. is a producer and distributor of industrial gases such as oxygen, nitrogen and argon. Held in the showroom of Mercedes-Benz in San Juan on April 11, 2016, Mercedes-Benz was tapped by EMME Subic Transport to provide their Actros trucks for the services they will provide for Linde Philippines. Present in the contract signing were Linde Philippines Managing Director Alexander B. Coo and EMME-Subic Transport Corp. President Gen. Edgar B. Aglipay (Ret.). 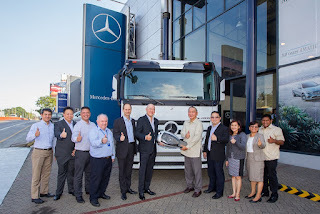 Joining them from Mercedes-Benz Philippines is Felix R. Ang, President of Auto Nation Group, Inc., the country’s general distributor of Mercedes-Benz.